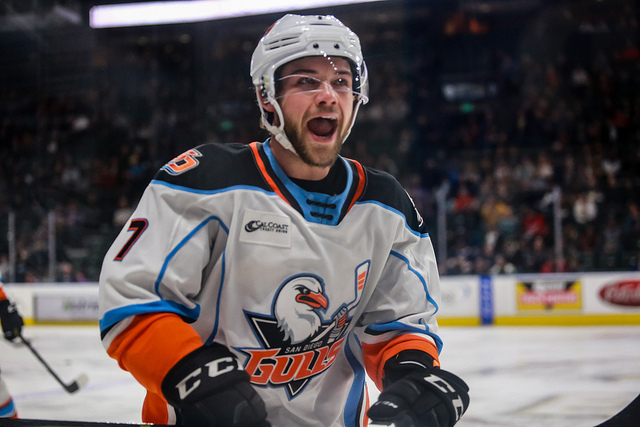 Chase De Leo scored one of two goals in Tuesday, Feb. 12, 2019, game against the Colorado Eagles where the San Diego Gulls won, 2-1. Photo courtesy of the Colorado Eagles. Chase De Leo and Corey Tropp scored first-period goals as the San Diego Gulls rebounded from their most one-sided loss of the season to defeat the Colorado Eagles, 2-1, Tuesday evening in Loveland, Colorado. Gulls goaltender Jeff Glass stopped 29 of 30 shots, three days after allowing six goals in two periods in Saturday’s 7-1 loss at Bakersfield. Glass “had a huge game,” De Leo said. De Leo opened the scoring two minutes, 36 seconds into the first period when he put a backhanded shot past Colorado goaltender Pavel Francouz for his 14th goal of the season. The Gulls (26-15-2-3) capitalized on a two-man advantage with Tropp’s goal at 12:03 of the first period. Defenseman Mason Geertsen scored his second goal in his 36 games with the Eagles and first since Nov. 9 with 3:02 left in the second period. Colorado (23-19-3-1) had six skaters to the Gulls four for the final minute-plus of the game after Sam Steel was called for interference and Eagles coach Greg Cronin pulled Francouz for a sixth attacker, but was unable to score the tying goal. Francouz (16-11-1-1) stopped 35 of 37 shots before a crowd at Budweiser Events Center announced at 4,872. The Gulls, the Anaheim Ducks’ American Hockey League affiliate, led in shots, 37-30, including a 14-8 advantage in the third period. The victory was the Gulls 15th in their last 19 games. The Gulls and Eagles, the Colorado Avalanche‘s AHL affiliate, will play again Wednesday in Loveland.